A common complaint on motorcycle GPS forums is vibration-induced shut-down when running off AAs. 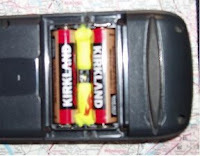 I experienced it as well, until I began wedging one or more rolled-up foam earplugs in the battery compartment and closing the door before they can expand. That was almost 40,000 miles ago and my GPS units (RAM-mounted Garmin 72 and Garmin 60Csx) haven't once shut down due to vibration even though my ZR-7S has a buzzy aircooled inline four and is regularly ridden on Pennsylvania roads (some MX tracks are smoother). It costs only pennies to put new earplugs in with each battery change. Some folks are spending $150 or more for high-tech vibration-dampening mounts. 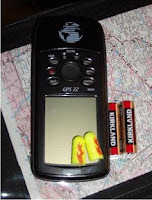 If your GPS suffers from bad vibrations, try my cheapie solution. While it might not work with bikes that are taken off-road, it just might do the trick for road warriors -- and you were just gonna chuck those old earplugs in the bin anyway, right?